BridgeEnglish Denver attracts many international students to its language center, where they are immersed in American culture and language. When asked, “Why study English in Denver?” many of these international students attribute their choice to the reputation of BridgeEnglish and its great location in Denver. However, current English student Andrea Meyer had a more unique reason to study here. While he enrolled in the BridgeEnglish three-month General English program to improve his grammar and writing skills, he also came to Colorado to train for what’s called Parkour, with the well-established community here. What is Parkour exactly? It is, essentially, an intense and athletic form of obstacle course training. “The basic idea of Parkour is to find the most efficient way to go from Point A to B in your environment, using just your body,” Andrea explains. In just seven years, 21 year-old Andrea has traveled from his home in Switzerland to 12 countries to train with Parkour communities around the world. After hearing the high praises about the Parkour community in Denver and Boulder, Colorado was next on his list. He was not disappointed. In fact, Andrea says that Boulder has one of the largest Parkour gyms he has ever seen. He also trains at the Skyline Park in Denver, and comments, “I’ve never been to a place that has so many good people who are strong in Parkour. Everyone is training really hard to achieve his or her goals.” Bridge teachers are also very supportive of Andrea’s Parkour training. In fact, Andrea has even been able to increase his English skills by writing and speaking about his passion for Parkour. Andrea is definitely a more unique student, as he is aiming to improve his English and Parkour training– two seemingly different skills. However, he sees the parallels between the two pursuits, likening the Parkour community to the community at Bridge: “I really like the teachers here. They do really active lessons and they care about your learning. You feel like you are part of a family.” He also likes how the teachers are very receptive to student concerns and priorities. His favorite course of the day is his independent study, where his teachers offer him the flexibility to do special projects. After Andrea is done with his English classes, he spends time training Parkour in Denver or Boulder, or goes back to his homestay family’s house. Both ways, he is able to experience full American cultural immersion. Also, since he is learning inside and outside of the classroom, Andrea is able to maximize his English studies at Bridge. 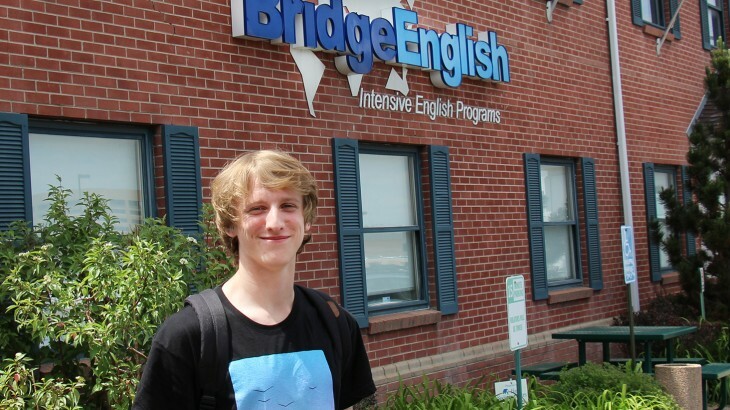 After his time at BridgeEnglish, Andrea hopes to enter college in Switzerland next year with both improved English and Parkour skills from the lessons he has had in Colorado. If you are interested in learning more about Parkour, see Andrea in action in his own Parkour YouTube videos! To learn more about General English classes at Bridge, click here. Post written by Nancy Choi, Bridge Marketing Intern. esl-blog, Meet our students! BridgeEnglish, Colorado, Denver, English, Parkour, Student, Student Profile, study abroad. permalink.